Actually getting through traffic to make it to happy hour? Not at all the best. Unless, of course, you're headed to The Spare Kitchen who are having late night happy hours, which goes at LEAST as late as 1am. 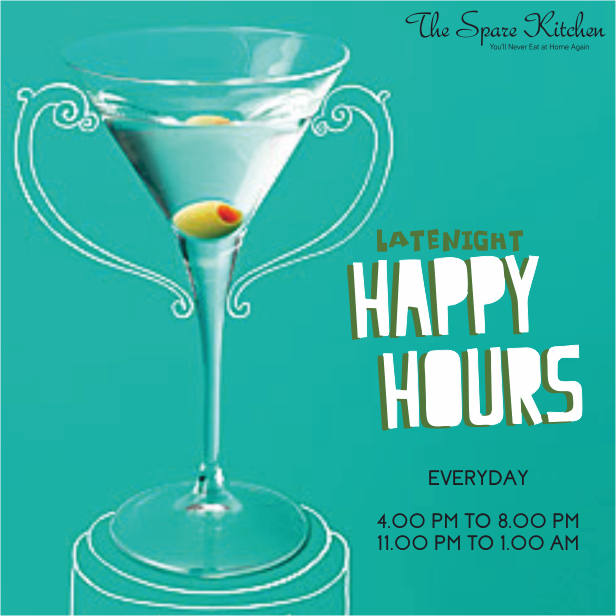 So, if you and your friends crave for late night bites and reverse happy hours, then The Spare Kitchen is the perfect destination to be. Along with their normal happy hours which go on from 4pm-8pm they will now also be offering you the perfect way to roll with or without an expense account. The late night happy hours commence at 11pm and goes on till 1am every day. So come down and try one of their signature cocktails like the Vodka Gola (basically everybody’s favourite snow balls flavoured with alcohol), TSK Mimosa, Blush Head, Mexi Sangria, Mud Slide, Bellini, Smoked Whiskey Sour and Planters Punch. Apart from that, they also serve amazing flavours of Martini like Watermelon & Citrus Twist, Fennel Infused, Cucumber & Basil and Pineapple & the Coco. Whether you consider yourself a night-owl, insomniac or none of the above, it’s never a bad idea to know where the best happy hour deals are hiding when you’re wide awake in the dark hours of the night. If you’re looking for a midnight snack or perhaps a second dinner paired with cheap cocktails, do not miss visiting The Spare Kitchen.